Welcome to Paz & Associates. You're welcome to browse our store and shop with confidence. Please give us a call should you have any questions about the resource to best meet your needs. And if you're a member of the American Booksellers Association, let us know since discounted rates apply. Thank you for visiting. 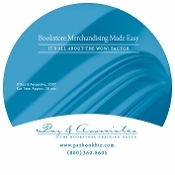 The most comprehensive workbook available for prospective booksellers and new store owners, with industry-specific details. A 50% deposit ($697.50) is requested to register for the online course and this four-day intensive workshop retreat, "Ready, Set, Open for Business!" Teaches simple concepts that turn sections and focal point displays into a professional presentation. Customized training foundation that quickly brings new hires to high levels of performance. Completing this 12-segment online learning program is a pre-requisite for attending Part 2, the workshop retreat.